Leicester City earned their first away point in the Premier League this season as Ahmed Musa levelled to secure a deserved draw for the defending champions at Tottenham. 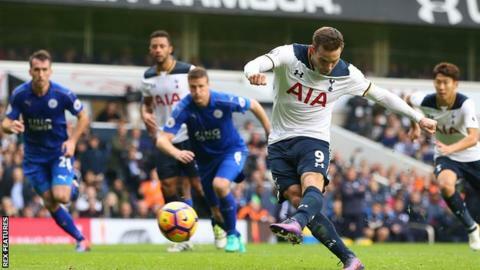 Vincent Janssen gave the hosts the lead at White Hart Lane, scoring his first Premier League goal from the penalty spot after Robert Huth had felled the striker. Spurs twice hit the crossbar - Dele Alli in the first half and Jan Vertonghen after the break - but had to settle for the draw as Musa caught them sleeping at the beginning of the second half. Leicester had lost all four of their previous away games this season - for a goal difference of -10 - but they battled well and frustrated a Tottenham side lacking a cutting edge in attack. The north Londoners, still unbeaten in the league this season, have now drawn a third successive league game and find themselves three points behind league leaders Manchester City, who beat West Brom 4-0. Tottenham were still without injured influential defender Toby Alderweireld, while midfielder Eric Lamela was ruled out through illness, but the player whose presence they missed most was Harry Kane. Manager Mauricio Pochettino included both Son Heung-min, scorer of four goals this season, and £17m summer signing Janssen in his starting line-up, but Spurs are not the same side in the final third without the England international's dynamism and ruthlessness as the lone striker. It was difficult not to wonder what Kane, sidelined since September with an ankle injury, would have done with Christian Eriksen's cross at the near post two yards from goal after Janssen mistimed his shot and swept the ball across the face of the goal. Janssen did score from the spot, as he also did in the EFL Cup defeat by Liverpool in midweek, and had chances to add to his tally - heading an Eriksen cross wide, then turning Huth adroitly and shooting a fraction off target. The Netherlands international, who scored 27 times in the Eredivisie last season, did not play badly - Pochettino said after the match he was happy with his striker's performance - but he is yet to match the standards Kane has set. Pochettino will surely hope this will be his team's final match without Kane, with the Argentine saying last season's top scorer could return for next week's derby against Arsenal. "I know Harry Kane makes a huge difference. But what they did last season was stretch teams," said Match of the Day pundit Alan Shearer. "They are not doing that at the moment and the pace in the final third is not as sharp as it could be. "They have to get their sharpness back into the game and ask more questions of the back four." Leicester's form away from the King Power Stadium has been poor this season, although three of their defeats were at Liverpool, Manchester United and Chelsea. Tottenham dominated, in the first half especially, and ended the match having enjoyed 63% of possession. Understandably, Pochettino said at full-time that he was disappointed with the result. But while the Foxes recorded a total of just three shots in the match - with only Musa's close-range equaliser from a Jamie Vardy cross on target - their success in stifling a Tottenham side who have now gone five games without victory deserved a point. Indeed, the champions are the only side to score against Pochettino's men in open play this season and questions could be raised about referee Robert Madley's decision to award Tottenham a penalty. Manager Claudio Ranieri is likely also to be pleased that he could once again shuffle his forward line - starting with Vardy, who was a substitute in last week's victory over Crystal Palace, instead of record signing Islan Slimani with one eye on the Champions League. Tottenham full-back Danny Rose marked Riyad Mahrez out of the match while being an outlet in attack. No other Spurs player touched the ball as often as Rose. All three of Vincent Janssen's goals for Spurs have come from the penalty spot. Robert Huth gave away a penalty in the Premier League for the first time since January 2013. Ahmed Musa has scored in back-to-back Premier League games, after failing to score in his first five league games at Leicester. Jamie Vardy has as many assists in the Premier League this season as he has goals (both two). Spurs have avoided defeat in their first 10 league games for the first time since 1990-91. Mauricio Pochettino's side have lost only once in their past 13 home games in the Premier League (eight wins, four draws). Tottenham face Bayer Leverkusen in the Champions League on Wednesday before a Premier League match at Arsenal on 6 November. Leicester travel to Copenhagen on Tuesday (19:45 GMT kick-off) where victory will guarantee their progress to the Champions League knockout stages. They will then aim to extend their unbeaten home run in the league to 21 matches as West Brom visit on 6 November. Tottenham manager Mauricio Pochettino: "Disappointed. We created chances. We dominated the game. But I am disappointed with the way we conceded the goal. It's hard to lose two points. "I was disappointed for the goal as the way we conceded was a little unlucky. I am happy with the performance. "We are still strong and unbeaten in the league, that is very important. It's true we are fighting and it's difficult to win games recently but the team showed it is strong enough." On Vincent Janssen scoring: "I am very happy with him. Since the day he arrived his behaviour and performance is always improving. it's important to have confidence and trust in him." Leicester manager Claudio Ranieri: "I am pleased with a point, with our performance. I saw the Leicester spirit, the way we stuck together and fought together. A very good performance. "Until now we played with a singular spirit, today was a squad spirit and the performance was outstanding. "Ahmed Musa is slowly understanding the Premier League. He is a good player but he must improve again." Match ends, Tottenham Hotspur 1, Leicester City 1. Second Half ends, Tottenham Hotspur 1, Leicester City 1. Attempt missed. Danny Rose (Tottenham Hotspur) left footed shot from the left side of the box misses to the left. Attempt missed. Leonardo Ulloa (Leicester City) header from the centre of the box is close, but misses to the right. Assisted by Christian Fuchs with a cross following a set piece situation. Leonardo Ulloa (Leicester City) wins a free kick in the attacking half. Attempt missed. Jan Vertonghen (Tottenham Hotspur) left footed shot from outside the box is close, but misses to the right. Offside, Tottenham Hotspur. Harry Winks tries a through ball, but Son Heung-Min is caught offside. Substitution, Tottenham Hotspur. Harry Winks replaces Victor Wanyama. Hand ball by Jan Vertonghen (Tottenham Hotspur). Jan Vertonghen (Tottenham Hotspur) hits the bar with a header from the centre of the box. Assisted by Victor Wanyama with a cross. Attempt blocked. Jan Vertonghen (Tottenham Hotspur) left footed shot from the left side of the box is blocked. Assisted by Son Heung-Min. Corner, Tottenham Hotspur. Conceded by Danny Simpson. Substitution, Tottenham Hotspur. Georges-Kévin Nkoudou replaces Dele Alli. Corner, Tottenham Hotspur. Conceded by Robert Huth. Attempt missed. Vincent Janssen (Tottenham Hotspur) left footed shot from the centre of the box is close, but misses to the right. Assisted by Kyle Walker. Substitution, Leicester City. Marc Albrighton replaces Riyad Mahrez. Attempt missed. Vincent Janssen (Tottenham Hotspur) left footed shot from outside the box is close, but misses the top right corner from a direct free kick. Substitution, Leicester City. Jeffrey Schlupp replaces Ahmed Musa. Attempt blocked. Christian Eriksen (Tottenham Hotspur) left footed shot from the left side of the box is blocked. Assisted by Danny Rose.